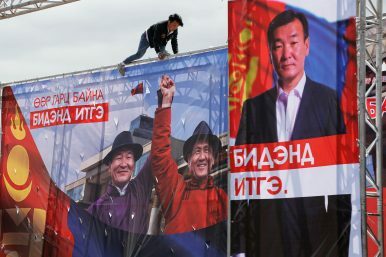 A man climbs the stage during a rally of the Mongolian People's Revolutionary Party (MPRP) as campaigning for Mongolian presidential elections begins in Ulaanbaatar, Mongolia (June 6, 2017). The banner reads "Trust us". The name of the business that Battulga has built has become his nickname, “Genco,” and is derived from the film The Godfather. Indeed. He did not attend university but instead built a career as a judoka and then in business. For some years, he seemed to rule his home-province of Bayankhongor with a judo-throwing fist, and jumped on somewhat odd projects, like the construction of a Chinggis Khaan theme park near the capital, Ulaanbaatar. Most visitors appreciate the large mounted statue of the Great Khaan, but Battulga’s contributions to Mongolian politics are a little less shiny. Even in the rumor-infused world of Mongolian politics, his reputation is for being more corrupt than most, bolstered by the April 2016 arrests of numerous associates. Others attribute these arrests to Battulga’s factional fights with Elbegdorj and see the MANAN fog behind these arrests, lending Battulga some vague outsider credibility. But, perhaps most damningly for his candidacy, he lost his parliamentary seat last year in an election that favored incumbents! His often off-beat notions of policy suggest that he is likely to spring surprises on Enkhbold, though they may also spell his doom as a candidate who could flame out. If Battulga loses big in the election, this could make a break-up of the faction-torn DP more likely. Ganbaatar was a surprise nomination by the MPRP. Having served as an independent MP in the previous parliament (2012-16), he built a reputation as the “last man standing” in questioning the wisdom of an agreement with Rio Tinto surrogate Turquoise Hill Resources over the giant Oyu Tolgoi copper project. This personal reputation was tarnished by revelations of having made up some of his educational credentials in addition to having run a Feng Shui businesses earlier which earned him his nickname. Oddly, he was part of machinations to take over a reform-minded party (not the MPRP) in the run-up to the parliamentary election and has now emerged as the MPRP candidate. Ganbaatar is likely to make somewhat incendiary statements on mining policy in particular, which some will interpret as “resource nationalism.” That empty label remains without an ideology, movement, and despite Ganbaatar’s candidacy, without a leader. Ganbaatar and Battulga are likely to make the 18-day election campaign, which kicks off June 6, interesting. At a time when some Mongolian voters are frustrated by the lack of true political choices, these firebrands may attract enough support to force Enkhbold into a run-off election if he cannot garner more than 50 percent of the votes in the first round. But there is also some possibility that voters might turn away from all three of these choices with some level of disgust and refuse to participate in the vote.